There’s a small bug in the mozilla addons site that affects some people trying to install “experimental” addons (“Invalid file hash”, corrupted downloads, etc.). The bug has been fixed according to bugzilla. If you had problems installing AnyColor, please try again or visit this knowledge base article. Update: The following steps may help solve the issue. New version out. No major changes except that this version is not compatible with beta 5, it requires the just-released Release Candidate 1 or a nightly. 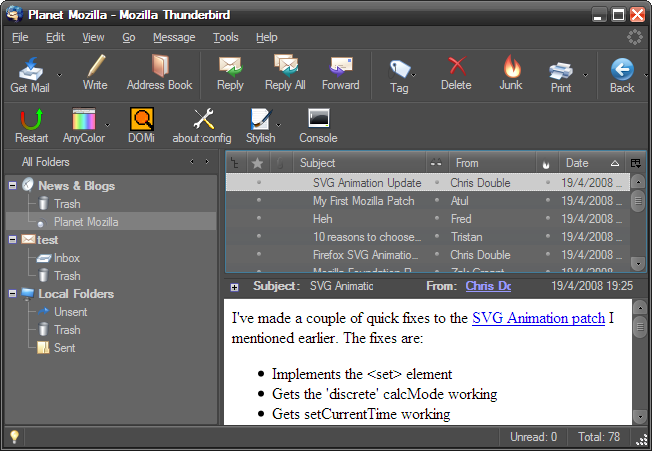 CSS updated for changes introduced in the new Firefox builds. Minor CSS tweaks for better compatibility with the Speed dial add-on. Added support for third-party master themes. No documentation on this feature yet; I’ll document it and offer a sample add-on that installs an alternative master theme soon. Focus outline was made a bit thicker (and better). After testing AnyColor on Linux, I marked it as Windows-only. 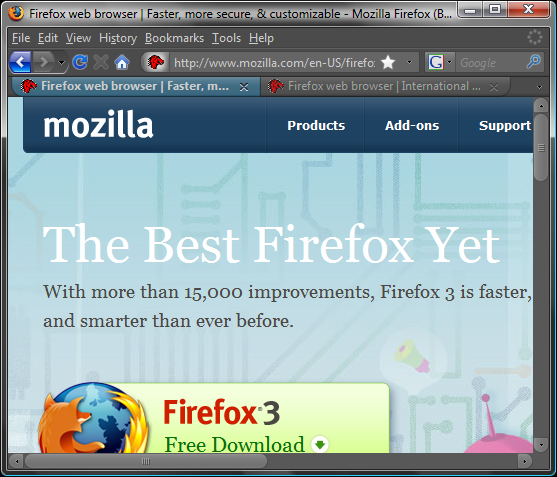 It did work on Linux but it didn’t look good because of the huge differences in Firefox’s default theme. I haven’t been able to test it on Vista yet (hope it’s OK) and I don’t think I’ll ever be able to test it on a Mac. Support for third-party master themes (already implemented): AnyColor will allow other theme creators to create themes that use it’s engine and replace the default master theme. I’ve also created a sample extension that does that. Allow user-specified CSS fragments that get processed after the master theme. Ability to preview & install a preset or CSS fragment from a web-page. UI improvements: Add AnyColor to the Tools menu, add an icon on the status bar and an option to automatically show the toolbar button/status bar icon on first install. Not yet but it’ll happen. There’s a lot of work to be done with the CSS and there are some other issues too. The biggest problem so far is that it won’t display background images that use the data: URI scheme. I’ve filed a bug and hope it gets resolved soon. Another issue is that Thunderbird 3 is still in early development and I expect many, many changes until the final version. Here’s a very early screenshot of AnyColor on Thunderbird 3.0a1pre. …but Firefox 3 isn’t available yet; it’s still in beta. This seems to have caused some frustration to several users. AnyColor uses several features introduced in Firefox 3, making it impossible to work with previous versions. To avoid any further confusion, I updated AnyColor’s description on the addons site and added a note explaining the situation. 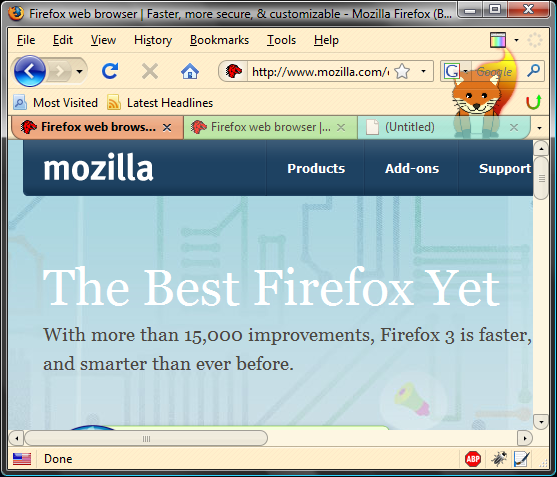 The good news is that the release of Firefox 3 isn’t that far and, once it’s released, you’ll definitely want to upgrade!